Commissioner Harold J. Wirths of the New Jersey Department of Labor and Workforce Development helps volunteers at the Sussex United Methodist Church organize and bag complete Thanksgiving dinners to be distributed to needy families throughout Sussex County. Image provided. SUSSEX, N.J.– The Christie Administration kicked-off its fifth annual “Season of Service” campaign today, as Commissioner Harold J. Wirths of the New Jersey Department of Labor and Workforce Development helped load, package and distribute nearly 100 turkey dinners to needy families throughout Sussex County. The annual Thanksgiving food drive is coordinated by the Sussex Help Center and other charitable organizations in Sussex County. Commissioner Wirths and his wife began the day early, loading frozen turkeys into trucks at the Weiss Market on Route 23 in Franklin. From there, the turkeys were delivered to the United Methodist Church on Bank Street in Sussex, where volunteers packaged them with donated canned goods and other seasonal foods. Complete holiday dinners were distributed at the church to needy families in the afternoon. All items were donated through the generosity of residents, businesses and local organizations throughout Sussex County. 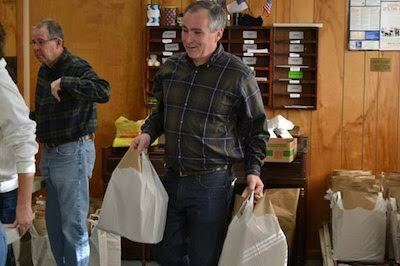 Labor Commissioner Harold J. Wirths (plaid shirt) and his wife, Debbie (white shirt), help volunteers package Thanksgiving meals for nearly 100 needy families as part of an annual food drive coordinated by the Sussex Help Center. Image provided. The Sussex Help Center, where Commissioner Wirths and his family traditionally volunteer their time, provides a variety of programs to Sussex and Wantage residents who are in need from its storefront on Main Street in Sussex Borough. Funding for the center comes from private donations, individuals and churches. The charity receives no federal, state or government assistance.